Enhances and promotes cellular communication while infusing a vital nutrient base required for optimal skin cell duplication and renewal. Leveraging the latest in proprietary cultured media technology, DNA Skin Care renders targeted sequenced signaling factors all without the use of any chemical additives. improves the appearance of fine lines, wrinkles, uneven skin tone, acne & acne scarring. It also improves the clinical health of your skin by stimulating a rejuvenation cascade that your body already has. See below before and after pictures. ​Number of treatments range greatly depending on what we are treating. Dermapen - Microneedling creates invisible micro-perforations and stimulates cells called keratinocytes that activate the production of new collagen by stimulation, rather than damage. While chemical peels, IPL & Laser treatments have their place in aesthetic skin care, they all produce improvement by injuring the skin to cause healing response. 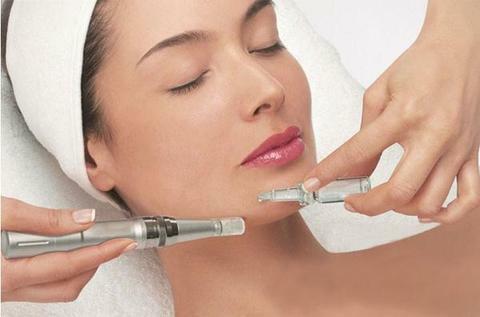 Dermapen - Microneedling is unique in that it stimulates improvement by the stimulated release of epidermal growth factors with virtually no damage to the skin.The treatment produces a clinically significant increase in the production of new collagen and elastin through the release of these powerful growth factors and cytokines. Dermapen - Microneedling produces maximum stimulation, with minimal inflammation. This balanced approach to skin rejuvenation reduces recovery time to near zero, while maximizing results! Dermapen - Microneedling can dramatically improve your skin’s firmness, smoothness, elasticity, hydration, sensitivity and tone. Visible improvement in aging skin, acne and other scarring, uneven or hyper-pigmented skin & overall tone and texture are real with Dermapen - Microneedling and with our expertise, we can show you how to make those results last! Let me show you how to get those results! Also FREE Anti-Wrinkle Mask to use at home 30 minutes after the treatment (while supplies last). Add on the Diamond Dermabrasion $25.00 – This Diamond Dermabrasion exfoliates the epidermis in a massage like manner to gently remove the outer layers of the stratum corneum, allowing for better penetration of the serum. This is done before the Micro-Needling. Add on the LED Light $25.00 – 30 Minutes under Light Benefits of the LED Photo-therapy is to improve cellular performance, healing and anti-inflammatory, increase circulation, accelerate tissue repair, kill acne bacteria, decrease inflammation, improve skin tone and clarity. This is done at the end of the Micro-Needling. Aftercare: The CryoStem Signal Plus ($175.00) are as important as the treatments. They are designed to maximize positive regrowth. They are used in the morning and evening. The name “Signal” is indicative of its action; enhancing and promoting cellular communication while infusing a vital nutrient base required for optimal skin cell duplication and renewal. Leveraging the latest in proprietary cultured media technology, DNA Skin Institute renders targeted sequenced signaling factors all without the use of any chemical additives. The next evolution of cryostem technology.